The above sign was taken in 10 March 1995, and the location was said to be Dungeness. However, I have seen no records of a pub in that area with that name. 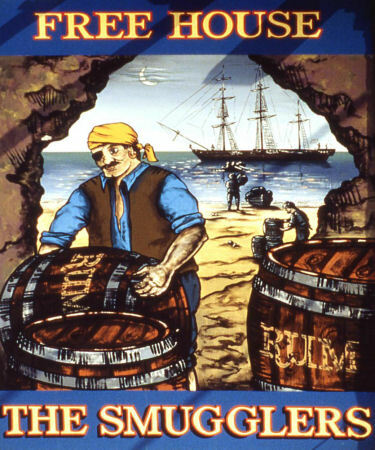 There was and still is a pub called the "Smugglers" at St. Margaret's at Cliff. Does anyone know where this pub sign came from and indeed if it is from St. Margaret's at Cliff? Michael Mirams points out to me that the book "Romney Marsh" by Keith Swallows says the pub the "Smugglers" was originally the "Britannia."